We do not worship the Gods. We do not! Worship implies that the Gods are “out there”, that they are separate from us, on a pedestal somewhere. Worship is bowing down to the Gods and asking them to do things for you, to forgive you, to absolve you. This is how it is done in the revealed religions of the Western world, and it is a system based on guilt. People do whatever they want all week, repeatedly violating their codes of behavior and morality, and then “make up for it” at the end of the week at church. Having “confessed”, they go out again and commit the same violations again. This cycle repeats itself endlessly. Modern knights do not subscribe to this approach. Instead, we base our system on empowerment. We replace guilt with responsibility. Remember Doreen Valiente’s Charge of the Goddess? The divine is within. Thou art God/dess. We don’t worship. We immerse ourselves in divinity. We entrain with divinity. We connect with divinity. We embrace divinity. We are divine. Religion should be about helping you live life to the fullest, not making yourself a martyr in hopes of a better afterlife. One of my favorite fantasy authors, Terry Pratchett, once said in his book Small Gods: “You can die for your country or your people or your family, but for a god you should live fully and busily every day of a long life.” That’s the way that we modern knights approach life. Knights replace guilt and shame with responsibility. Man’s relationship with divinity is a symbiotic one. We create divinity in our image and, in turn, the divine creates us. We are born from divine energy, fashioned from the dust of the stars. We reduce the infinite dimensions of this vast and awe inspiring universe that we live in to finite aspects that our minds can encompass. The Order of Paladins teaches novices this right from the start. Some of our earliest lessons involve creating new deities to deal with problems in our lives. This shocks some new people at first: How can they presume to create a God? I tell them that every God of every pantheon of every religion that has ever been was invented by some guy or gal somewhere: Every single one of them. If thou art God/dess, why not create another? We have a lot of fun with this. And it works. In Order of Paladins training, the novice starts with classes on energy, magick and psychic abilities. We don’t go near the subject of ritual in any meaningful way until our novices get to their second degree. 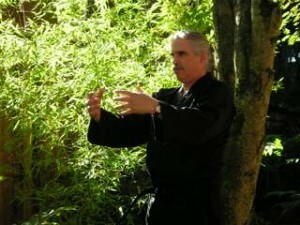 In this we are inspired by one of the precepts of Ginchin Funakoshi’s “Twenty Rules for the Dojo”: “Spirit first, technique second.” This approach is taken partially because we want the novice to realize that it isn’t the ritual or the ritual paraphernalia that creates the magick. You create the magick. It isn’t the ritual that creates the energy. Energy is all around all of us waiting to be used. All that one needs to do magick is oneself. All that you need to do is to learn to set that energy in motion and direct it with your will. Another advantage to this approach is that ritual is much more effective if the people doing it have this grounding in energy and magick. So mastering magick and energy work is the logical starting point.